It's finally here! 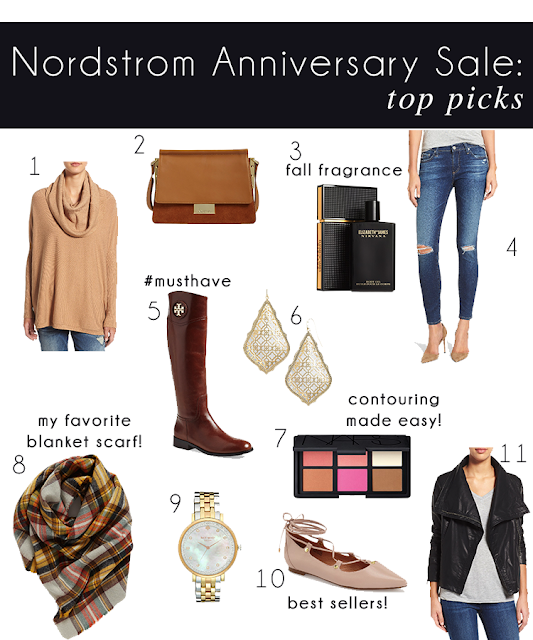 Early access to the Nordstrom Anniversary Sale opened this morning and it was definitely worth the wait. Earlier I shared my strategy on how to shop the sale, so today I thought I would share my top picks! When you look at the sale for the first time, whether that be online or in store, it can be really overwhelming because there is just so. much. stuff. It's so easy to get distracted, so focus on the items you know you have to have like Tory Burch Riding Boots and Handbags that have the potential to sell out quickly. Once you have your must haves, focus on staples like sweaters and jewelry. If something you had your heart set on sells out before you get the chance to buy, keep checking the site because they do tend to restock throughout the sale period! While shopping online, fit can sometimes be an issue, but with Nordstrom you don't have to worry! They do a fabulous job of explaining sizing online - I've only had to return a few items because they didn't fit how I wanted them to - and if your items arrive and they aren't just right, they offer free shipping for returns or you can easily return in store. Lastly, I'll be sharing some more of my favorites at certain price points and reviewing the things that made their way into my cart over the next few weeks. I'm planning on heading to the store later today, so be sure to follow along on snapchat and Instagram to see what I find!